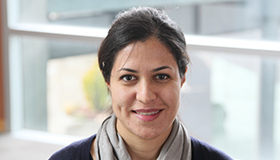 Leila Aflatoony holds a MSc degree in Product service system design from the Politecnico di Milano, a MA degree in Visual Communication from the University of Arts in Tehran, and is currently completing her doctoral studies at Simon Fraser University in the School of Interactive Arts and Technology (SIAT). Her PhD thesis explores interaction design thinking strategies in secondary school education to enhance students’ creative thinking and problem solving abilities. Her research interests are focused on interaction design education, design thinking, everyday design, human-centered design, user-centered design, participatory design, and creative thinking. In addition, she has been involved in interaction design research projects aiming to develop interactive technologies for museums. Her professional experience and collaboration with industry includes graphic design, web design, and UX/UI design for mobile applications.